Strolling through Nice's Old Town the other week, I spied a shop piled high with espadrilles - all colours and patterns, some flat and some with heels. Ahhh... it is finally summer, I thought! So of course, I had to buy a pair (this season's nautical blue and white stripe, small wedge heel, for those who are interested in such things). The point is that I have been so busy with clients flying in and flying out that I haven't really even noticed the perfect golden days of these early summer months. Head down, I have been flitting between searches for villas and apartments. All successful, I am pleased to say. I jokingly tell people that I have a track-record of success to maintain - but it is only half joking. With my latest clients returning home this week after a whirlwind visit of one day of viewings (and settling the following day on a fabulous apartment in a glamourous and rather well-kept secret neighbourhood of Nice) I now have a quiet-ish moment to contemplate a long Riviera summer. I am asked all the time does it feel like I am on permanent holiday living on the Côte d'Azur? Well yes and no. Yes I have the beach on my doorstep and the sun overhead. But when working, there is not much time to enjoy the Riviera life. But I have decided that the time has officially come to launch summer. I shall be putting on my espadrilles and stepping out. 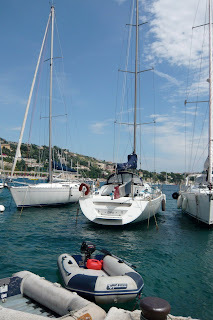 First stop Villefranche sur mer for a swim and lunch at one of the port-side restaurants. Villefranche is one of those picture perfect seaside villages on the Côte that never changes. Tourists come and go, the season gets busy with cruise ships, yet this fishing village's beauty and smallness doesn't seem drowned by the waves of outside attention. 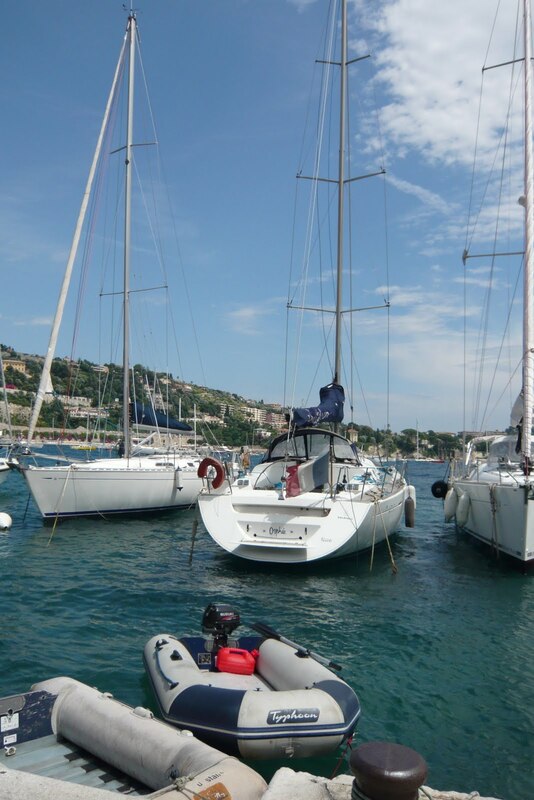 Property prices are especially high in Villefranche. A combination of exquisite charm, its desirable position close to a sandy beach and proximity to both Nice and Monaco. A four-bedroom villa with sea views will be advertised for around 5 to 6 million euros. A recent search for clients in this area turned up some great properties, however, that were certainly negotiable (250,000 - 500,000 euros off was the standard whisper from the estate agents who know my clients always buy and don't play me for a naive incomer). In the end, my clients and I settled for a villa in Eze bord de mer - just round the corner from Villefranche. Another beautiful spot but, like Beaulieu, slightly more exclusive. Whether its Villefranche, Beaulieu or Eze, my new pair of espadrilles sums up the spirit of these villages perfectly. Relaxed, beachy and definitely summer in the South of France. Hi, do you remember the name of the shop in Nice Old Town? I can't remember the name off the top of my head, but it is on rue Pairolière!